Robert Nichols (Stockton University), David Gilmartin (North Carolina State University), and Matthew Cook (North Carolina Central University) organized and held two workshops for junior Pakistani scholars working towards PhDs in History as part of AIPS’ Junior Faculty Training and Exchange Program. The “History Dissertation Workshop” was held at the Punjab Higher Education Commission in Lahore on December 29-31, 2018 and the “History Research Methods and Proposal Workshop” was hosted at Quaid-i-Azam University in Islamabad on January 3-4, 2019. Thirteen different participants attended each workshop. 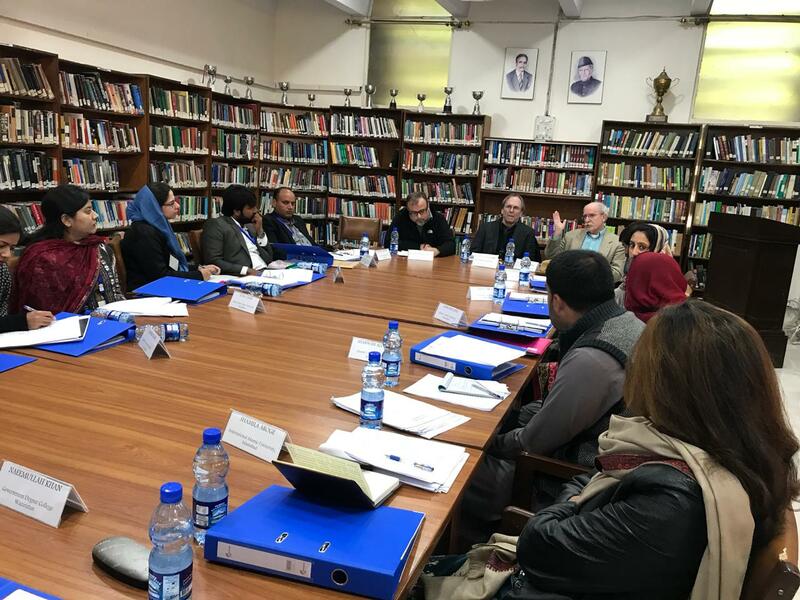 AIPS solicited applications from multiple History Departments in Pakistan, and the faculty organizers selected a range of participants who included representatives from across the diverse provinces, regions, and universities of Pakistan. Participants were graduate students and junior faculty at the proposal, research, and writing stages of their research projects/dissertations. Individual projects were presented and discussed in detail, while workshop sessions also opened conversations about research methods, scholarly literature and argumentation, and recent examples of successfully completed academic history books of interest to scholars, including historians of Pakistan-related issues, themes, and historical perspectives. Robert Nichols is a professor of History at Stockton University in Galloway, New Jersey. He has published articles, book chapters, edited volumes, and books on subjects related to early modern, colonial, and post-colonial history in the region. David Gilmartin is a professor of History at North Carolina State University and has been involved in South Asian and Pakistan-related scholarship in numerous ways for many years. Matthew Cook, a professor at North Carolina Central University, is an interdisciplinary scholar of anthropology, history, and especially for these workshops, Sind province and British colonial history. He is currently the Vice-President of the American Institute of Pakistan Studies.